Here’s a quick one. I don’t think too much needs to be said about the Dean Martin Matt Helm films. You either love ‘em or hate ‘em. Fans of Donald Hamilton’s book series generally hate them. And critically they get panned too. But sometimes I think the Matt Helm films get a bad wrap. Sure, they aren’t tough like the books they are based on, but they do have Dean Martin doing what he does best; boozin’ and having a good time. And is there anything wrong with that? Murderer’s Row is the second Matt Helm film, following The Silencers and while not quite being up the the first movie’s standard, it is still a decent piece of swingin’ sixties espionage cinema. The plot is simple enough. Julian Wall (Karl Malden), who works for the nefarious ‘Big O’ has kidnapped a scientist who has been constructing a ‘helio beam’. Once Wall has control of the ‘helio beam’ he intends to destroy Washington D.C. Secret Agent Matt Helm (Dean Martin) has to find the missing scientist and save the world. He does this with the aid of the scientist’s wild go-go dancing daughter (Anne Margaret). Yep, the plot is paper thin, but it is only there to hang Deano’s boozin’ jokes on. Where the film starts to fall down is during the action sequences in the second half. They are all rather uninvolving. Maybe this is because they are mostly filmed as long shots, and even then you can clearly tell that the guy on the screen is not Martin but his stunt double. At the end of the day you either enjoy Deano’s drunken lounge spy antics or you don’t. If you don’t this film will infuriate you, with some of the lame set ups and jokes. But if you don’t mind Deano’s breezy throwaway style, then Murderer’s Row will be a reasonably pleasant diversion. 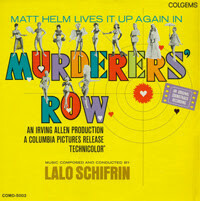 One thing that Murderer’s Row has got going for it, is an absolutely fantastic musical score by Lalo Schifrin. The riff from the title tune will get stuck in your head for days. Although relatively short by today’s standards (around 30 minutes), the soundtrack album is well worth tracking down.